In 1979, then university chaplain, now emeritus, Rev. Bev Asbury organized what would prove to be the first of the now longest continuous Holocaust Lecture Series at any American university. Under the rubric “Holocaust: Jewish and Christian Perspectives,” prominent theologians and philosophers Irving Greenberg, Emil Fackenheim, and Franklin H. Littel, as well as one of the leading survivor memoirists, Gerda Klein, spoke to the greater Vanderbilt community. Since then our ongoing examination of ourselves and our society in the wake of the Holocaust has brought such notable figures as Elie Wiesel, Simon Wiesenthal, Claude Lanzmann, Lawrence Langer, Nechama Tec, Deborah Lipstadt, among many other scholars and survivors, along with an array of artistic engagements with the Shoah (dance, film, music, painting, photography, theater) to campus. The series has also been committed to drawing our community’s attention to past and present acts of genocidal violence, including those wreaked upon Armenians, Kurds, Native Americans, Roma, Tutsis, and Yazidis. It has addressed such general themes as art, gender, law, medicine, and theology, as well as the particulars of perpetration, resistance, standing by, and living on. Almost seventy years since the UN’s adoption of the Convention for the Prevention and Punishment of Genocide, we still find genocide and institutional discrimination. Join us as we reflect on the Holocaust and our society, and as we look ahead to our common future. And beyond reflection and anticipation lies responsibility. We bear responsibilities to teach, to learn, and to stand up for human rights. 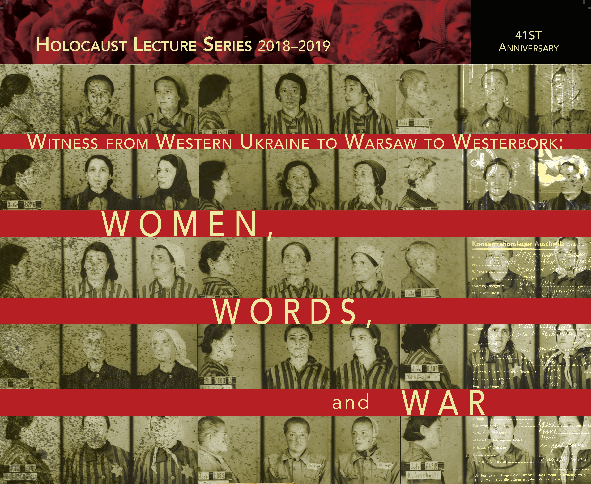 Please join the forty-first annual Vanderbilt University Holocaust Lecture Series, a partnership of the Vanderbilt University Office of the University Chaplain and Religious Life and Vanderbilt Hillel, as it explores, through lecture, music, film, and conversation, the Holocaust and what it means for us today.